These thick and chewy Oatmeal Chocolate Chip Cookies are the best! They’re the perfect size and are loaded with oats and chocolate chips. We are a serious house divided here when it comes to chocolate chip cookies. I’m not saying it’s as dire a situation as Romeo & Juliet, but there have been some lively discussions here about chocolate chips, ha! The first time that I made chocolate chip cookies for my husband, early on in our dating courtship, I enthusiastically presented him with a plate of my favorite thick and chewy chocolate chip cookies, and waited for him to take a bite. He said they were delicious, but… (uh oh, a but). Then… he asked why they didn’t have oats in them. Confused, I told him that I had made chocolate chip cookies, not oatmeal cookies. As it turns out, the chocolate chip cookies he had growing up always had oats in them. Also, I want ALL the chocolate chips in my cookies, and he prefers much less in his. 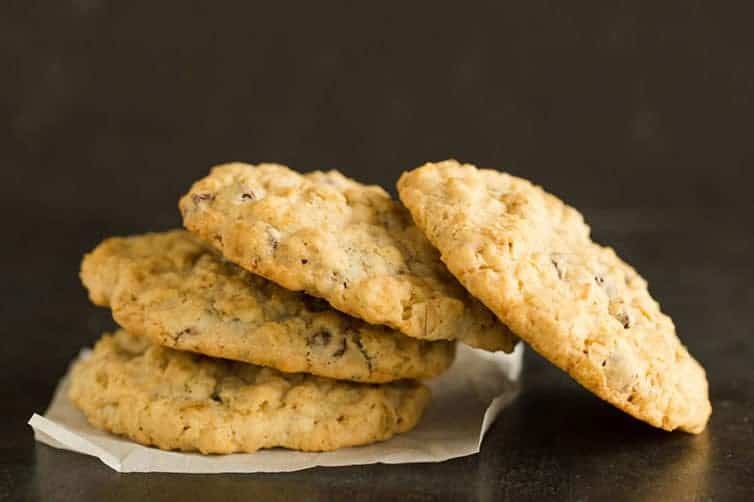 It’s been nearly nine years and we still don’t see eye-to-eye on chocolate chip cookies – from the inclusion (or exclusion) of oats to the ratio of dough to chocolate chips, we just don’t have the same tastes. I’ve realized that I’ll never be able to make him love the same types of chocolate chip cookies I do, so I extended an olive branch. I made straight-up oatmeal-chocolate chip cookies with the ratio of dough to chips that he likes. Everyone deserves cookie utopia, after all! 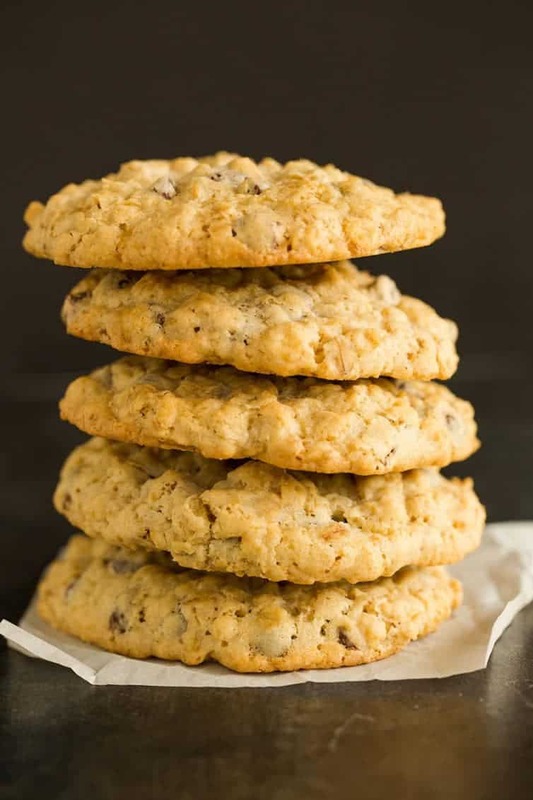 These cookies are very similar to my favorite chewy oatmeal-raisin cookies, but I left out the spices, added some vanilla and threw in the chocolate chips. You can make these cookies smaller or larger, depending on your personal preference, just be sure to adjust the baking time accordingly. You know I love large cookies, so I often make these larger than the two-tablespoonful size called for below. If you’re a fan of oats and chocolate, I guarantee you’ll love these cookies (no matter your feelings on actual chocolate chip cookies, ha!). These thick and chewy Oatmeal Chocolate Chip Cookies are the best! They're the perfect size and are loaded with oats and chocolate chips. 1. Preheat oven to 350 degrees F; adjust oven racks to low and middle positions. Line baking sheets with parchment paper. 2. Whisk the flour, baking powder and salt in a small bowl; set aside. 3. Cream together the butter and both sugars on medium speed until light and fluffy, about 3 minutes. Beat in the eggs, one at a time, and then mix in the vanilla. 4. Stir in the flour mixture with a wooden spoon or a large rubber spatula, then stir in the oats and chocolate chips. 5. Using 2 heaping tablespoons per cookie, roll the dough into balls and place on the cookie sheets, spacing them at least 2 inches apart. Bake until the cookie edges are just turning golden brown, but the middles are still quite pale, about 12 to 14 minutes, rotating the sheets from front to back and top to bottom halfway through the baking time. Cool the cookies on the baking sheets for 2 minutes, then transfer to a cooling rack to cool for at least 30 minutes. Cookies can be stored in an airtight container at room temperature for up to 5 days. This recipe was originally published on January 8, 2013. I did something I don’t usually do. I halved the recipe and added approx 1./8 cup more,oatmeal. I added extra chopped pecans and no white sugar. They were delicious. loved these cookies! soft, full of oats and chocolate–these really hit the spot! Hi Maureen, So glad you enjoyed these! 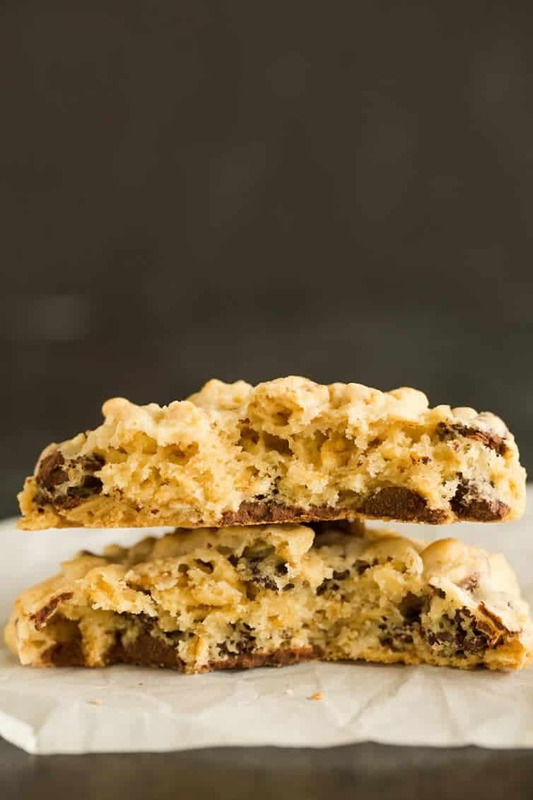 I don’t have an oatmeal chocolate chip cookie recipe with cinnamon, but you can add a little to this one and see how it tastes! I made these cookies and the flavor was great. However, I used about 1/2 the sugar and they were still too sweet. Also, the batter was quite dry. Maybe needs more butter? So, the cookies did not spread at all. Hi Julie, Cutting out that much sugar would definitely impact the texture of the cookies. Made these for a bunch of teenagers. Hoping the oatmeal would make up for the lack of nutrition from their day to day! My two teen boys loved them, so I’m sure the high school hand will also love them! Flaky and buttery, chewy and chocolately. Great cookies! You were one of the first food blogs I stumbled upon years ago…..whether it be something sweet or savory, your recipes have never failed me! Heading into the kitchen as I speak, to bake these beauties! Have a wonderful, happy, healthy holiday season!!!! It’s quite an interesting story you have at home with these chocolate chip cookies, Michelle! I apologize, oatmeal chocolate chip cookies :) Will definitely give it a try!